Winner’s Pot is split into two with one half being awarded to the highest 5 card hand and the other to the lowest 5 card hand. Seven Card Stud Hi Low is a poker game for 2 to 8 players using a standard deck of 52 cards. This variation of Seven Card Stud is played in the same way where each player receives seven cards in total, three cards will be dealt face down and four cards face up. The difference with Seven Card Stud Hi Low is that the pot is split into two pots, this means that two players can win on the same hand. One pot is won by the player with the best five card high hand from the poker hand rankings and the other pot is won by the player who has the best qualifying low hand from the low poker hands ranking. If nobody qualifies for a low hand the player with the best high hand will win the whole pot. 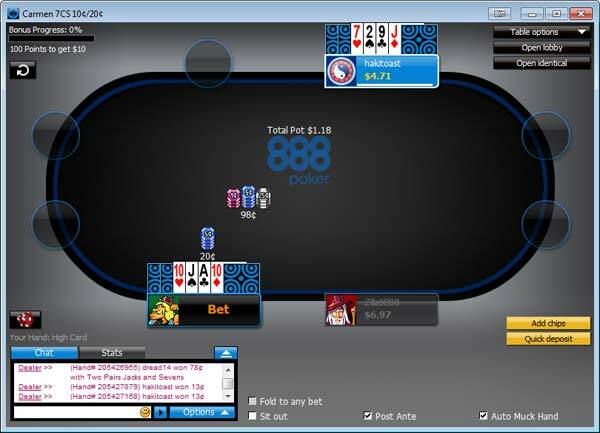 This game can be played using any of the three betting limits (No limit, Pot limit and Limit) with the most popular being limit. Limit has two betting values, a low bet value and a high bet value. If you sit at a $1/$2 table, $1 is the low value betting amount and $2 is the high value betting amount. The amount each player is allowed to bet at one time will depend on which betting round it is. There are five betting rounds in Seven Card Stud Hi low. The first two rounds will only permit bets of the low value amount and the last three will only permit bets of the high value amount. Each betting round will have a maximum of four raises so the most each player will have to put in will be four times the betting value amount of that round. For further details on limits and how this affects the betting rules please read our guide to Poker Stakes & Betting Limits. So… How do you play 7 Card Stud Hi Lo Poker? 7 Card Stud Hi Lo is played in the same format as the standard 7 Card Stud game. During a hand each player will receive seven cards in total which can only be used by that player alone. Three of the cards will be dealt face down and can only be seen by that player (known as “down cards”) and four cards will be dealt face up for all players to see (known as “up cards”). From these seven cards they must make two 5 card hands, a high hand and a low hand. Each hand may use different cards. How is the Pot split in 7 Card Stud Hi Lo? One pot is won by the player with the highest ranking poker hand. The second pot is won by the player with the lowest qualifying hand from the low poker hands rankings (the worst hand). If no player holds a qualifying low hand then the whole pot will go to the player with the highest ranking high hand. High ranking poker hands are the normal standard hands from the poker hand rankings that are used in most poker variations and in the standard version of Omaha. The highest being a Royal Flush and lowest being just a high card. A low hand must contain five different cards that are all numbered eight or lower for it to qualify. Straights and Flushes are ignored but Pairs or Three of a Kind are no good and cannot be counted. For more detailed information see our guide to low poker hand rankings. The best low hand you can get is 5-4-3-2-A and the worst qualifying low hand is 8-7-6-5-4. The hand is always counted down from the highest card so if some one had 8-7 low against some one with 8-6 low, it does not matter how the other three cards run the 8-6 low will win. For a low hand to qualify all the cards in a players five card hand (made up of three community cards and two cards from the players hole cards) must be numbered 8 or lower. If even one card is numbered 9 or higher a low hand is not possible. 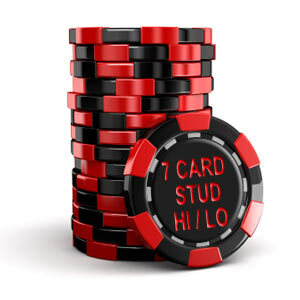 A 7 Card Stud Hi Lo poker hand is played in a identical way to a standard Seven Card Stud hand. For a more detailed explanation of the stages then read our How to Play 7 Card Stud guide or see below for a summarised version. A Seven Card Stud poker hand starts off with the allocation of the “Dealer Button”. The dealer button is a marker that goes around the table in a clock wise rotation one position per hand. The dealer button marks out which player the dealer will deal cards to first which is the player to the left of the dealer button. Before any cards are dealt each player must put an ante into the pot which ensures there are chips to be won every hand. The ante amount is normally 1/10th of the low value bet amount so at a $1/$2 table the ante amount would be $0.10. Once the Antes have been put forward each player will receive three cards, two cards face down which are called the hole cards and one card face up for all to see called the Door card. The player with the lowest value Door card exposed will “bring in” which means he has to put forward the first bet. This player has the choice to either put in the minimum bring in amount which is normally 1/5th of the low value bet or to raise to the small bet. So on a $1/$2 table the bring in amount will be $0.20 or the raise amount will be $1. Fold – which means his cards are taken away and he will play no further part in the hand. Call – which means to match the amount of chips put into the pot by the previous player. Raise – which means to increase the amount of the current bet by an increment of 1 small bet. All other players must then match the increase bet to continue in the hand. All raises in this round must be the same as the low value bet amount. There can be only one bet and three raises permitted in total for each betting round. The action will go round the table in a clock wise rotation until all players who wish to continue in the hand has put equal amount of chips in the pot. The next card is dealt to all remaining players face up and this card is called the fourth street. Once again another round of betting commences and the first player to act is decided by which player has the best two exposed cards on show. This player has a choice whether to check or bet. All bets and raises in this round must be of increments of the low value betting amount. Once the betting has finished and all remaining have either checked or matched any bet made, the game moves onto the next round. A fifth card is dealt to each remaining player face up and another round of betting will start. The bets from this round onwards will be in increments of the high betting value, so on a $1/$2 table each bet or raise will be $2 from now. The sixth card is then dealt to all players face up and another round of betting will commence. A seventh and final card will be dealt to all remaining players face down. From this point all players will know what their final hand will be and a final round of betting will start. If two or more players are left in the hand after the final round of betting has finished we then move onto the showdown. All cards are revealed at this point to determine who wins the pot or each pot if there is a qualifying low hand. Seven Card Stud Hi Lo is an expansion to the standard version of 7 Card Stud but with more to think about. Suddenly you are trying to think about both your high and low hands as well as try and work out the high and low hands of your opponents – your workload has doubled. Seven Card Stud is not as popular online so you need to ensure that you choose an online poker site that has Stud tables running. If you want to try 7 Card Stud Hi Lo then you should head over to our Play Poker section where we can recommend to you an online poker site that is trusted and also offers 7 Card Stud Hi Lo. Practise is the best way to learn, so pick a low value stakes 7 Card Stud Hi Lo table and just experiment until you get used to all the stages above.